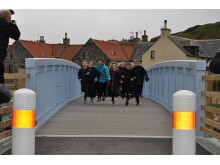 The new footbridge over the Burn of Cullen was officially opened yesterday – and immediately tested by a group of local P7 pupils. 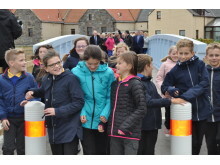 Cullen Councillor Ron Shepherd cut the ribbon and formally declared the bridge open, after which pupils from Cullen Primary 7 were invited to be the first to run across it. The new structure replaced the previous 90-year-old bridge which was beyond repair. In addition to the new 19.3metre bridge, the £418,000 project included the construction of a new sea wall to provide protection to the access road; stone protection upstream of the bridge to the banks of the Cullen Burn, diversion of the water and electricity supplies that were attached to the old bridge, and new tarmac path approaches. The footbridge provides the only safe route between Seatown and the golf course, as the A98 has no provision for pedestrians. 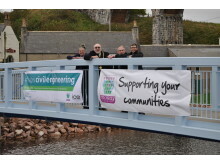 At the formal opening yesterday, Cullen councillor Ron Shepherd said he was delighted to see the project completed. 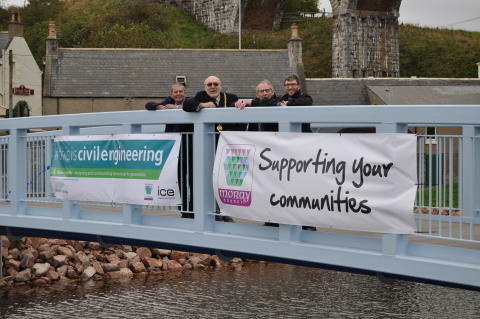 He said: “This footbridge represents a significant investment in the Cullen community. “The Seatown bridge it replaces lasted for a very respectable 90 years; I would sincerely hope this one lasts even longer. 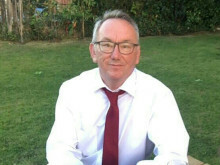 For residents and visitors alike, it provides a safe link between the village and the golf club facilities, the beautiful beach and the coastal trail. 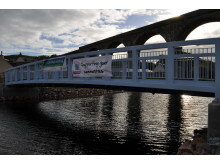 The project was managed by engineers in Moray Council's Consultancy section. The bridge has a clear span of 19.3m (face to face of abutments), and is three metres wide. Made of steel with a hardwood timber deck, the paint system used is designed to last 20 years before needing any maintenance. 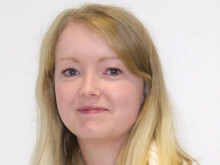 The main contractor for the project was Balfour Beatty, with plant and earthworks undertaken by Billy Miller Ltd.